Spillages, stains and odours are a part of our everyday lives and it is inevitable that these will occur at some stage. If something does get spilt on your carpet there is no need to panic - it is how you approach the stain that will determine how well it can be treated. With Xtract2clean's knowledge and expertise the appearance of most spots, spills and stains can be removed and we are always happy to receive a call if you have a spillage and are indecisive about your next step. Do: Call the experts at Xtract2clean, we have the products and machinery allowing us to work on the stain to get the best results possible. Gently dab the surface using a damp, cold, clean white towel working from the outside of the spillage towards the centre to prevent any dangers of expanding the damaged area. Dont: Reach for the nearest househould cleaning shampoo products and spray them on. Most of these fluids tend to set the stains, clog the pile and leave a sticky residue which will stay in your carpets and upholstery over time darkening the stain and attracting dirt because of the dried in foam which will be impossible to get out! 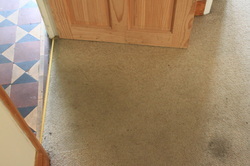 Never scrub and rub the pile of the carpet, it will become distorted and lock in the stain, lose its colour and lead to permanent damage. If you have a stain caused by a pet please do call the professionals - these stains are acidic and if soaked into the back of the carpet will crystallise - when the weather gets warmer urine etc will decrystalise and create an odour. Hot water extraction is a must for the deepest of cleans.